Abstract: This paper proposes multi-view display using a digital light processing (DLP) projector and new active shutter glasses. In conventional stereoscopic active shutter systems, active shutter glasses have a 0-1 (open and closed) state, and the right and left frames are temporally divided. However, this causes the display to flicker because the human eye perceives the appearance of black frames when the other shutter is closing. Furthermore, it is difficult to increase the number of views because the number of frames representing images is also divided. We solve these problems by extending the active shutter beyond the use of the 0-1 state to a continuous range of states [0, 1] instead. This relaxation leads to the formulation of a new DLP imaging model and an optimization problem. 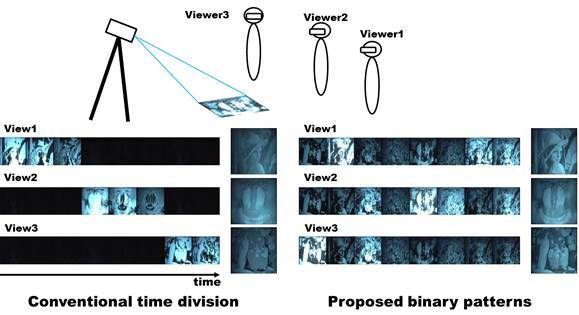 The special structure of DLP binary imaging and the continuous transmittance of the new active shutter glasses require the solution of a binary continuous image decomposition problem. Although it contains NP-hard problems, the proposed algorithm can efficiently solve the problem. The implementation of our imaging system requires the development of an active shutter device with continuous transmittance. 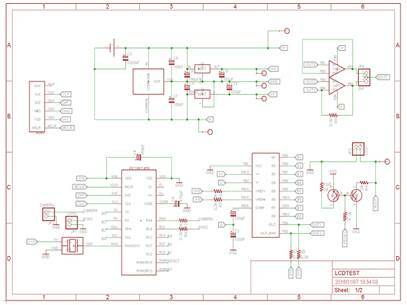 We implemented the control of the transmittance of the liquid crystal display (LCD) shutter by using a pulse-width modulation (PWM). A simulation and the developed multi-view display system were used to show that our model can represent multi-view images more accurately than the conventional time-division 0-1 active shutter system.